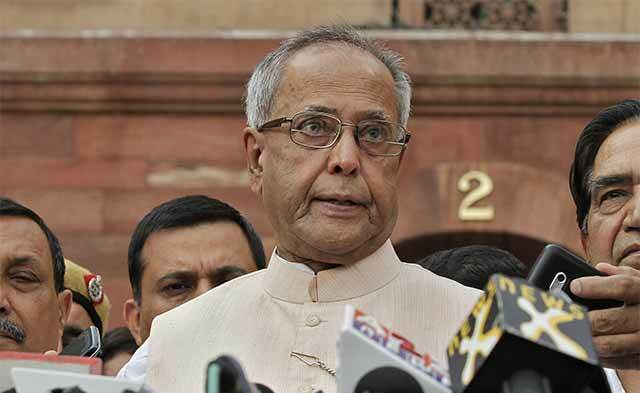 President Pranab Mukherjee on Tuesday urged political parties to let the budget session of Parliament function thereby allowing the National Democratic Alliance (NDA) government to carry out its pending work. “Our Parliament reflects the supreme will of the people. Democratic temper calls for debate and discussion, and not disruption or obstruction,” said Mukherjee, while delivering his speech to the joint sitting of both the Houses of Parliament on the first day of the budget session 2016. The government has prioritised 32 items for the budget session including 11 bills pending in Rajya Sabha and one in the Lok Sabha. The prominent ones include the Goods and Services Tax (GST) bill and real estate bill. While the former is expected to remove barriers to trade between the states and economically unify the country, the latter will bring in the much-needed transparency in the unregulated real estate sector. The budget session comes in the backdrop of the ongoing controversy at the Jawaharlal Nehru University wherein its student union leader has been arrested on charges of sedition bringing the opposition parties together. Also, the breakdown of law and order machinery in Haryana by Jat agitators demanding reservation in government jobs is expected to be discussed in the current session. In the hour-and-fifteen-minutes long speech delivered at the central hall of Parliament, the President emphasized on the achievements of the government in the past one-and-a-half years after assuming office on 26 May 2014. Focusing on India’s infrastructure, Mukherjee mentioned various initiatives taken by the government to improve India’s economy. Prime Minister Narendra Modi’s government has started various schemes in sectors such as roads, railways, ports, power and mining. Mukherjee did not spell any expectation from the Union Budget to be presented by finance minister Arun Jaitley on 29 February. India’s economic affairs secretary Shaktikanta Das in an interview with DD News on Monday had said that given the fiscal constraints and other parameters under which the government has to function, the effort is to present a budget which is growth-oriented, maintains the momentum of growth and tries to develop on it. “India is a haven of stability in an increasingly turbulent global economy. GDP (gross domestic product) growth has increased making India the world’s fastest growing economy among large economies. Inflation, fiscal deficit and current account deficit have all decreased,” Mukherjee said. In the last budget, the government had targeted fiscal deficit at 3.9% for 2015-16 and 3.5% for 2016-17. It is also expecting a GDP growth of 7-7.5 per cent for 2015-16 at a time when the Index of Industrial Production and manufacturing growth data have painted contradictory pictures about the rate of growth. In a pre-budget statement, Rohit Inamdar, senior vice-president with ratings agency ICRA Ltd, said that the infrastructure sector expects higher budgetary allocations towards specified large infrastructure projects such as bullet trains and dedicated freight corridors. Talking about the NDA government’s aim to provide electricity to all and the country’s move towards clean energy, the President said that the government plans to reach a renewable energy capacity of 175 gigawatt by 2022. The President added that a majority of the 73 stalled road projects have been revived, 7,200 km of highways have been completed and 12,900 km of highway projects have been awarded---the highest ever. Mukherjee also mentioned government’s initiatives such as houses being built for slum dwellers, increase in subsidized domestic cooking gas connections for below poverty line families, the smart cities programme, reduction in energy shortage, new scheme for the turnaround of the state-owned electricity distribution companies and financial assistance to domestic shipyards, among others.